Here are two of our four sheep. We got them on the same premise as the pigs, ie to fatten up over the summer, in the hope they would add some variety to our meat diet. Better than pigs they wouldn’t need feeding and would be a very economical source of deliciousness. The maths look good – lambs cost £60 each, the grazing costs about the same for six months, and the slaughter costs are £12.50 a sheep. Bargain. 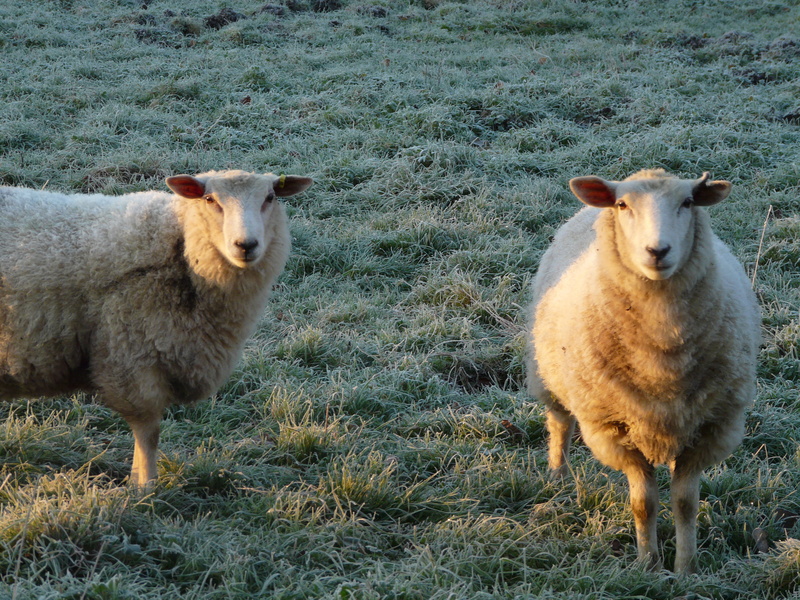 Yet here they are, in one of the first frosts of winter, still relaxing happily in the field rather than stewing gently in a Lancashire hotpot. It probably shouldn’t have taken a vet to tell us they had a very high worm count and needed immediate treatment. That was a fun afternoon but all were duly dosed and in a few days the stools were solid once more. We were also advised that they would need hard food to fatten up, and some hay for roughage and general eating now the grass has lost its goodness. All my worst fears were realised. We can now add feed at £8 a bag, hay at £3 a bale, and vet treatments to the bill. Assuming we can keep them alive until spring this is going to be some of the hardest earned meat we’ve enjoyed.